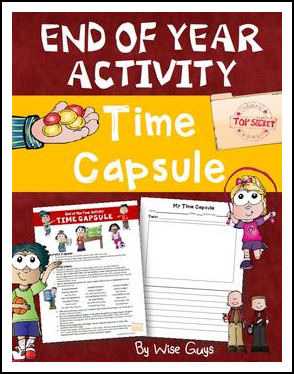 Here is an end of the school year time capsule activity that is sure to be a hit with your students. This is a great way to end the year! -a one page student template where students get a chance to put a page into the time capsule. If you enjoyed this activity, you will not want to miss our 150+ page end of the school year bundle! Click here for the End of the Year Super Bundle! Copyright ©Wise Guys. All rights reserved by author. Copying for more than one teacher, classroom, department, school, or school system is prohibited. This product may not be distributed or displayed digitally for public view. Failure to comply is a copyright infringement and a violation of the Digital Millennium Copyright Act (DMCA). Clip art and elements found in this PDF are copyrighted and cannot be extracted and used outside of this file without permission or license. Intended for classroom or personal use ONLY.